This Sunday, rehearsals start in earnest for an exciting project which sees musicians from our Young Artist Development Programme collaborate with National Orchestra for All (NOFA) for the first time. 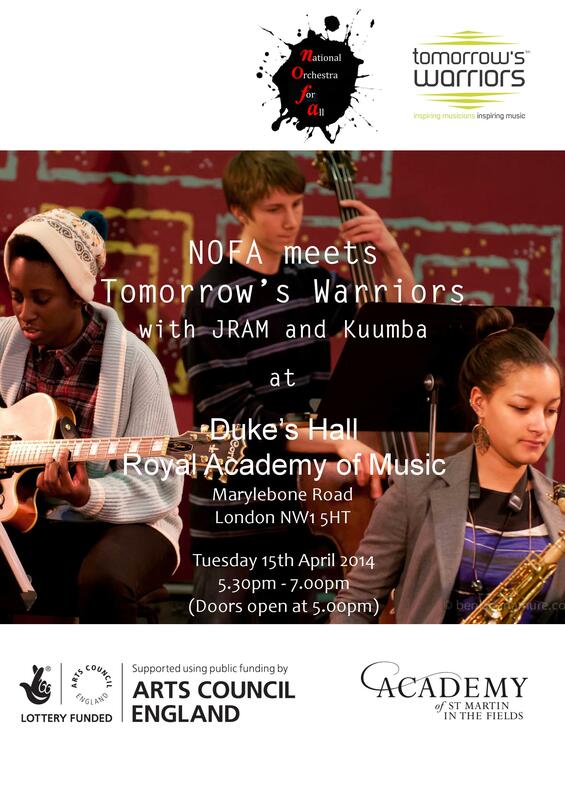 Established in 2011 and inspired by El Sistema, NOFA is aimed at young musicians with a passion for music but who, through no fault of their own, face barriers to musical progression and high quality experiences. We are delighted to be playing a large role in NOFA’s Easter programme as together we explore the musical connections between Jazz and Classical Music. This culminates with a concert on Tuesday 15th April @ 5.30pm in Duke’s Hall, Royal Academy of Music. On the menu is Duke Ellington’s interpretation of Grieg’s ‘Peer Gynt’ Suite, a new arrangement of Bernstein’s ‘West Side Story Suite’ and a re-working of ‘1001 nights’ by Nathan Theodoulou. Specifically written for the project and featuring Tomorrow’s Warrior Nubya Garcia as the soloist, this piece will be a show-stopping finale pitting the full NOFA orchestra alongside the Tomorrow’s Warrirors Big Band, all held together by Tomorrows Warrior’s music leader and maestro Peter Edwards. Fab workouts for vocalists this summer at RAM!